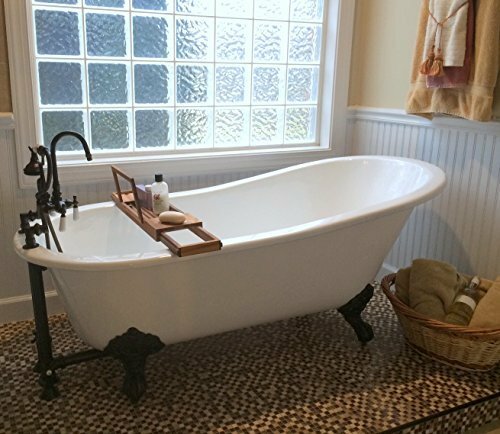 Cast iron tubs are one of the oldest types of bathtubs around and they still give homeowners as much class and purpose as they did centuries ago. Made of one of the most durable materials around, a cast iron tub can likely remain in your home for many years to come. This guide will look at some of the best cast iron bathtubs that can meet a range of budgets, style preferences, and bath time functions. Our reviews offer helpful information that will help you decide what you need in a tub and what kind of cast iron tub may best match your family’s needs. 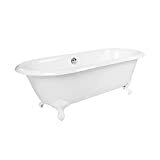 The MAYKKE Shirley Traditional Oval Clawfoot Tub has a classic look that’s updated for a more contemporary bathroom design and its durable construction may be worth the higher price point for some. The Kohler K-837-0 Bellwether 60-Inch by 30-Inch Cast Iron Bath is an excellent choice for installation within an alcove, but it has wide ledges that you won’t typically find in other alcove-ready tubs, which can be helpful for bathtub storage. If you’re looking for a traditional cast iron tub style, the Chariton Cast Iron Slipper Tub probably has it. 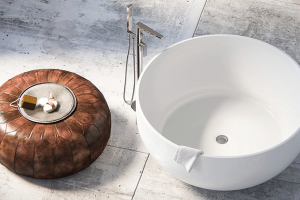 Made from cast iron but coated with porcelain on the interior, the tub might be one of the easiest to clean. 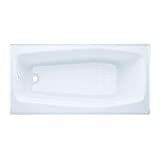 The Toto Enameled Cast Iron Bathtub is a no-frills tub that offers strength and durability with a plain finish that can fit within most bathroom designs. KOHLER K-715-0 Villager Bath is another alcove-ready design with a unique internal mold that can give you some extra width for your upper body as you recline in the bath. Our cast iron bathtub reviews include five of the best cast iron bathtubs based on their quality and customer satisfaction balanced with a fair price tag. MAYKKE’s Shirley might offer the best of both worlds for you if you’re looking for a mix of classic and modern. The clawfoot tub has vintage appeal but with a glossy, updated style that can make it fit seamlessly in contemporary bathroom design. You can use this tub with a freestanding water filler that you can place in the middle or on either end to fit within your design. 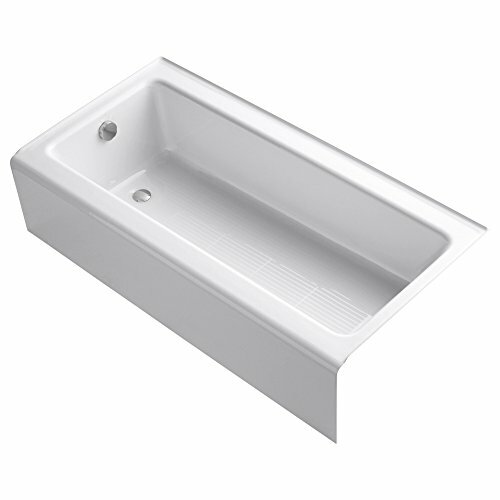 The tub includes an overflow hole and drain for quick and easy drainage. Thanks to the bathtub’s 8-layer construction, it can hold your water’s warmth for a long time so that you can enjoy your relaxing bath. People who have purchased this MAYKKE tub appreciate that it’s well-protected during shipping and gives them the updated, yet classic, look they were targeting with their bathroom remodel. The Kohler Bellwether cast iron tub is one that can meet your needs if you have an alcove but still want the benefits of a cast iron tub. Made from Kohler’s durable cast iron material, this tub can give you the right balance of modern design appeal and long-lasting durability. A stand-out feature of this tub is its wide ledges all the way around that you usually don’t see on alcove tubs. This is perfect for people who don’t have a lot of bath and shower storage. Also unlike many cast iron tubs is the non-slip bottom surface that can help you get in and out of the bath safely. With its low sides, even young children can likely enter and exit with ease. 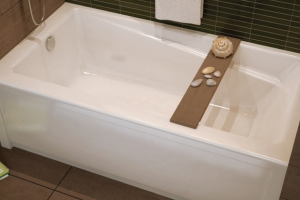 People who have purchased this tub love its sleek look and its durable, quality construction. The Chariton Cast Iron Slipper Tub may be the best choice for you if you want the most traditional cast iron tub design. With its feet that come in different finishes – bronze, chrome, and brushed nickel – you can choose the one to best fit your bathroom design for some added vintage appeal. This tub is one of the smallest on the list, holding up to 46 gallons of water, so it may not be the best option for tall people who need a lot of water to soak in. However, the tub has a small footprint that may work well with small bathrooms. 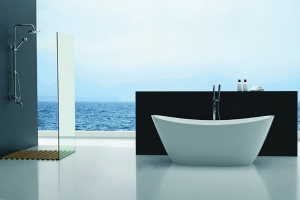 The interior has a coated porcelain finish to make keeping the tub clean a bit easier than with full cast iron tubs. Some customers have had problems with the feet not sitting tight against the tub, but most are thrilled with the classic design in their bathrooms. Toto’s cast iron bathtub offers a little more roominess than the other alcove-ready tubs on our list, making it ideal for soaking. The inside has about a 30-inch width to let you stretch out a bit as you recline. The design of this Toto tub is straightforward. It looks similar to a traditional acrylic or fiberglass tub, but you’ll benefit from the thick cast iron construction that may outlast less expensive tubs. This tub comes with flanges on its three non-aproned sides that you can tile-in for a seamless look that can prevent leaks, mildew, and water damage over time. The price of this tub is higher than similar alcove tubs, but customers agree that it looks stylish in their bathroom updates and its quality is virtually unbeatable. Kohler’s Villager bath is another one of its alcove-ready cast iron tubs with an included apron that can make your installation as straightforward as possible. This tub has a compact size that’s good for one-person bathing and its low sides can make it easy for most people to get in and out of. At one of the lowest price points you’ll find for a cast iron tub, this may be a good option for you if you’re working within a strict budget, but still want the long-lasting durability of cast iron. 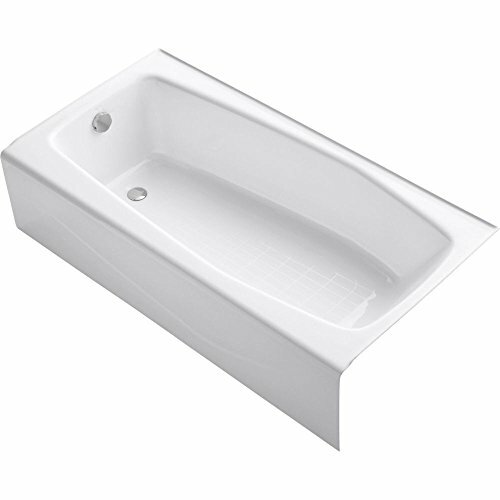 The inner mold of this tub is unique in that it has a wider upper body area to allow you to recline comfortably. 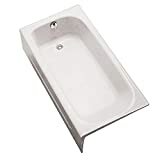 Several customers agree that this Kohler tub is an excellent deal for its price, but some don’t like the look of the non-slip bottom surface. You’ve fallen in love with the look and idea of a brand-new cast iron tub, but is it the right choice for you and your bathroom? Here are a few important things to consider before deciding on cast iron and how to navigate your options once you have decided. 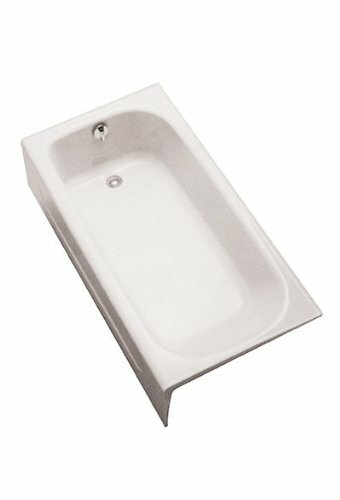 Can My Floor Support a Cast Iron Tub? Cast iron is heavy. In fact, it creates most of the heaviest bathtubs on the market. You might love cast iron tubs, but your bathroom floor could pay the price. If you live in an older home, your floor may not be able to support the weight of a new cast iron tub. 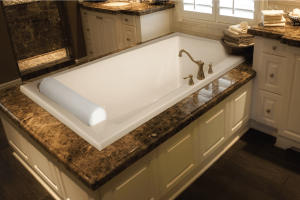 It’s a good idea to hire a contractor for a consultation before purchasing your tub. In most cases, a professional can update your floor to withstand the weight, but that, of course, means more money out of your renovation budget. Is Cast Iron the Best Material for My Needs? Cast iron is undoubtedly one of the most durable materials you can choose for your bathtub. Tubs made with this material are likely to last through the decades without a hitch. Cast iron can also keep your bath water warmer for longer than cheaper materials, like acrylic. A tub works similarly to a cast iron pan, heating up slowly and holding in that heat for a long time. You’ll have to pay for the benefits of cast iron, though. While acrylic, fiberglass, and other less expensive materials can make tubs in the $200 to $400 range, you’ll easily spend at least $500 on a cast iron alcove tub and upwards of $1,000 on a freestanding cast iron bathtub. Another drawback of these tubs is that they can be difficult to clean because cast iron is porous and can trap dirt. 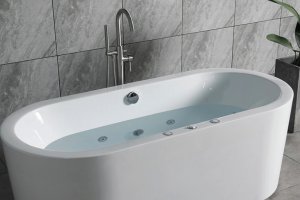 Many modern tubs have an internal coating of porcelain or another easy-to-clean material, but you’ll need to look for this feature specifically if you want a tub with simple cleaning. What are the Differences Between Types of Cast Iron Bathtubs? In bathtub terminology, a skirt and apron mean the same thing and refer to the piece of the tub that goes along its front face. These tubs are meant to be installed in an alcove. Once installed, the apron will face out into the bathroom. Tubs with aprons don’t have as much material as others, so they tend to be much lighter and less expensive. Clawfoot cast iron tubs are reminiscent of the most classic designs, so many people choose them because of their vintage style. They have curved feet to hold the bathtub and the tub usually sits lower to the ground than other cast iron tubs. Clawfoot tubs tend to have the lowest water capacity and bathroom footprint, yet they can still be extremely heavy. Pedestal tubs have a bottom pedestal that gives them their name. Freestanding like clawfoot tubs, these bathtubs still have a classic style with a bit of a more modern twist. Pedestal cast iron tubs are among the largest, heaviest, and also tend to hold the most water. They can be a good option for tall people who need some extra room in the tub. What cast iron tub makes it to the top of our list? Although it has one of the higher price tags of tubs in our guide, we believe the MAYKKE Shirley Traditional Oval Clawfoot Tub can give you the most bang for your buck in terms of looks, durability, and performance. Its 8-layer construction makes it stand out as a long-lasting tub that will keep your bath water warm for just about as long as you need it to. Its design is a mix of both classic and modern, making it an excellent choice for contemporary bathroom remodels with a little bit of vintage flair. We hope that our review of the best cast iron bathtubs helps you find the perfect tub that fits your design and exceeds your expectations for years to come.